Twins? Tight on space? 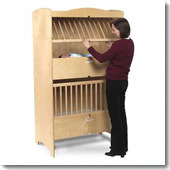 Try Whitney Brothers Double Decker Baby Cribs. Nope. It’s not a typo. Whitney brothers has really created a two in one crib. Innovative, space saving plus patented safety features – what more could you ask for.